Russia to Ban Bitcoin Exchanges? In another change of heart, Russia’s government seems to be turning cold on Bitcoin as President Putin and the Central Bank publicly warn about the dangers of using cryptocurrencies. During a conference address in Moscow, First Deputy Governor of the Central Bank, Sergei Shvetstov, spoke about the “dubious” nature of digital currencies while news outlets report that there might also be a ban of cryptocurrency exchanges in the making. If a ban is enforced, Russian players who’ve resorted to Bitcoin to avoid governmental restrictions could face another blow. According to Reuters, Russia’s President Vladimir Putin spoke on Tuesday about the risk of cryptocurrencies and their use for funding criminal activities while the Central Bank’s representative also stated that access to Bitcoin exchanges will be blocked in the country. This latest update comes two months after the government announced a delay of its proposed Bitcoin legislation but also assured that it was only a delay and not a cancellation. Shvetsov, who spoke to a Moscow conference about the need to protect investors, reportedly said that the Central Bank and the government “cannot stand apart” on this matter. He stated that an easy and direct access to “dubious instruments” like Bitcoin couldn’t be given to retailers (investors), according to the news source. 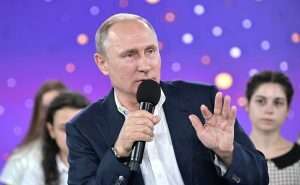 In a different address, in Sochi, President Putin also spoke to the media about the possibility of using cryptocurrencies for money laundering, tax evasion, and terrorism funding purposes, saying that the usage of digital currencies “carries serious risk”. He reportedly stated that since digital currencies are issued by an unrestricted number of anonymous bodies that whoever buys cryptocurrencies could also be engaging in illegal activities. The reported ban on Bitcoin exchanges resulted in a mysterious “flash crash” that took the price down by several hundreds of dollars on some Bitcoin indexes. Concerns about the dangers of Bitcoin’s volatility and the inability to investigate crimes like a Bitcoin exchange crash were also voiced in August, when a delay of the legislation was announced. However, following the latest information there has been no official confirmation from the Finance Ministry on whether the plan to legalize Bitcoins will be definitely cancelled. Legalizing Bitcoin in Russia has been a problem for over a year now, with the government first declaring an official war against the cryptocurrencies only to change their heart this year, when Bitcoin grew significantly after January. With the price of Bitcoin nearly 600% higher than its value in 2016, the Russian government seemed to be warming up to cryptocurrencies and a new legislation. However, some of the latest updates from Russia suggest the legislation might turn out to be quite different than what most people expect. Namely, by the end of August, Russia’s Deputy Minister of Finance, Alexey Moiseev, told a state-owned media outlet that they will be restricting the use of Bitcoins only to “qualified investors” and not the public. With that interview and the latest attitudes expressed by the government, it seems that if a legislation is passed it might not be as liberal as in other jurisdictions like Japan.